Due to a combination of time and stomach constraints, we didn’t make it to all the places listed above. But seven unique delights in 36 hours isn’t too shabby! 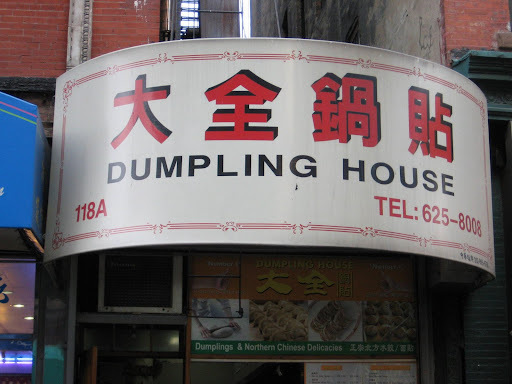 Our first and last meal was at Dumpling House located in my brother’s ‘hood—the Lower East Side. Astronomer: Dumpling House was an amazing find—delicious northern Chinese cuisine at truly incredible prices. With my friend Miho in tow, the total dinner bill for three came out to a mere $8 for twenty pork and chive dumplings, two large stuffed sesame pancakes, and a bottle of water. Placing our order in the chaos of the crowded, tiny restaurant was not easy, but we eventually managed to communicate with the staff and received our food. 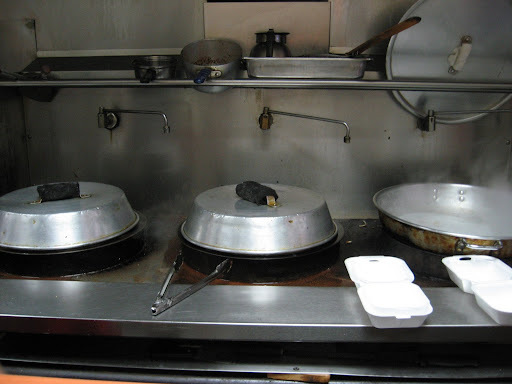 Gastronomer: While the wait at Dumpling House can be long due to its immense popularity and limited staff, the open kitchen provides great entertainment. There are a handful of stools located in the back of the restaurant for in-house diners, but the restaurant’s cramped space isn’t the most inviting. 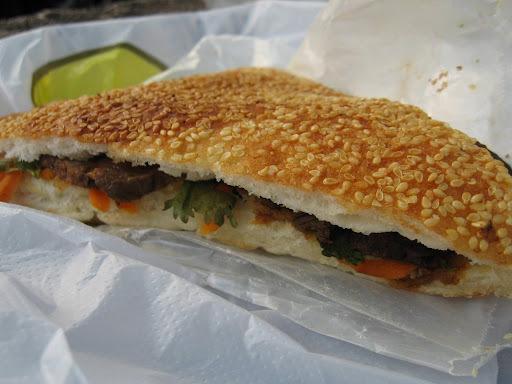 We took our dumplings and sesame pancakes to Roosevelt Park two blocks away to enjoy. 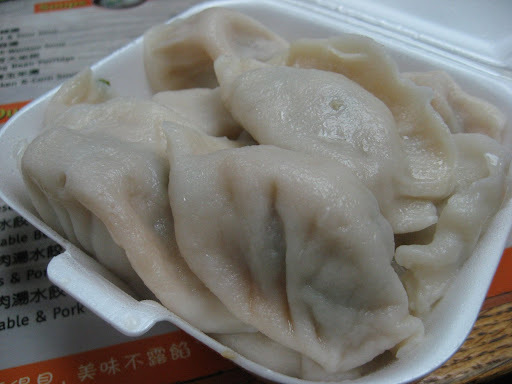 Astronomer: Both varieties of dumpling were flavorful and juicy; so juicy in fact that we were forced to eat standing up to save our clothes. 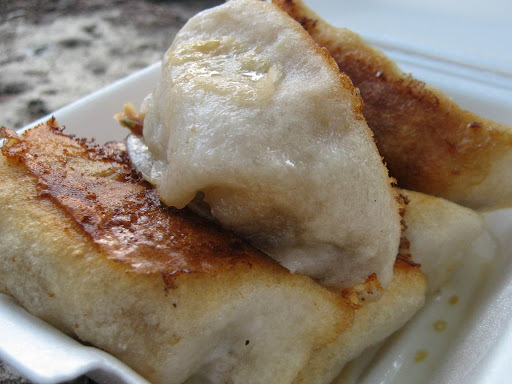 I preferred the boiled dumplings, while the Gastronomer liked the pan-fried ones. We all agreed that both types were irresistible. Gastronomer: The fried dumplings had the most wonderful texture that was both soft and chewy, especially along the crisped edges. The boiled dumplings’ exterior was delicate and subtle. 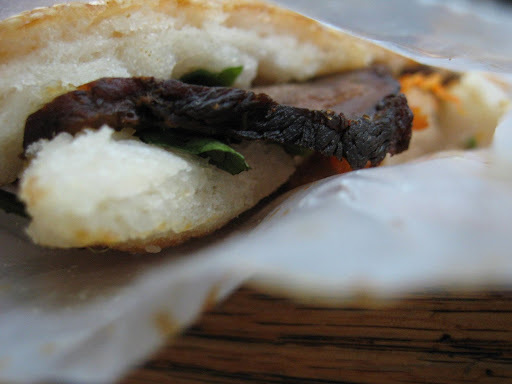 The pork and chive interiors were seasoned fantastically; definitely no soy sauce required. 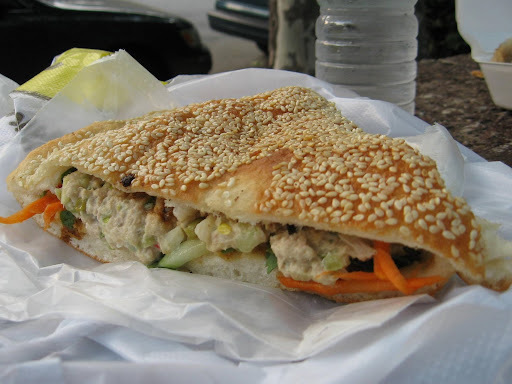 The sesame pancakes were an interesting creation—giant spheres of dough are deep fried and cut into triangular wedges. The wedges can either be eaten plain or sliced down the middle and stuffed with tuna, beef, or vegetables. 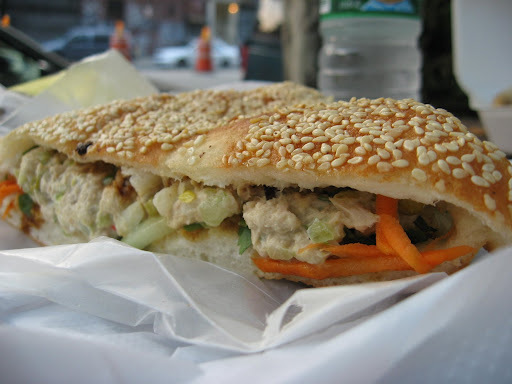 Each sandwich is garnished with pickled carrots and cilantro, which reminded The Astronomer and I of bánh mì. 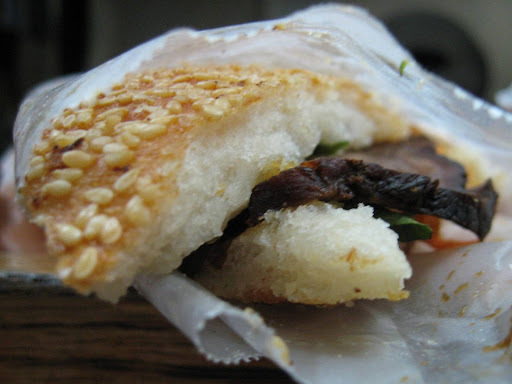 The tuna filling was spicy, while the beef was smoky in flavor. I highly recommend the tuna sesame pancake. Astronomer: We liked everything so much that we gave Dumpling House the honor of being the only place that we visited twice on our tour, returning the next evening after our plans to eat at N.Y. Dosas fell through. There are a number of places in Chinatown that serve dumplings on the cheap (5 for $1), but the amazing part is that they are mostly really good. 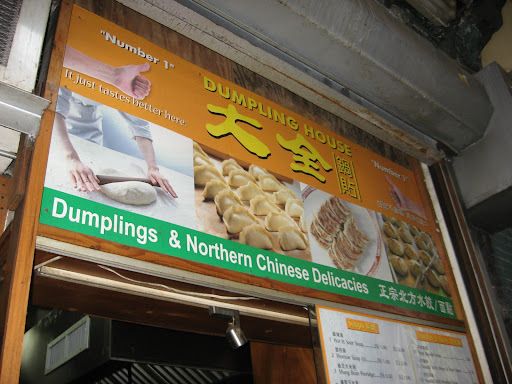 I’ve been going on dumpling tours (4-5 places an outing) to see which restaurant has the best dumplings and Dumpling House’s Pork and Chive dumplings were among my favorite. As for the rest of your list, Magnolia Bakery is good to go once, but their other cupcake types (try the hummingbird) are better than the regular ones. Momofuku was great, Luger’s is good, but there are better steaks to be had, and I’m dying to go to Shake Shack myself; I refuse to wait two hours though. That burger better be divine for a 2 hour wait! i always get the worst customer service at billys. i don’t know what their problem is. Billy’s Bakery is awful. Bad service and even worse food. The red velvet cupcake was so tasteless and dry. Try Sugar Sweet Sunshine instead. Their red velvet and pistachio cupcakes are to die for.